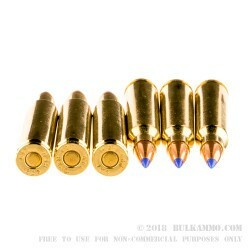 The accuracy of this ammo is very impressive even compared to some well known match grade ammo that sells for double this price as observed after a recent range outing by our staff. 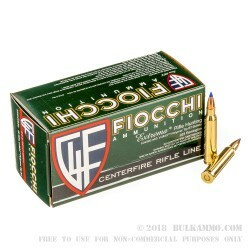 This 40 grain lightweight projectile has very tight groupings and is loaded by Fiocchi using Hornady's polymer tipped v-max projectiles. Whether you're looking for highly accurate 223 ammo for the range or are heading out west on a prairie dog hunt this product is a great performer exiting the muzzle at a zippy 3,650 feet per second. 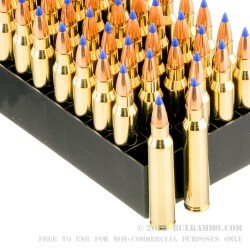 This bulk case of 1,000 rounds contains reloadable brass cases that are boxer-primed. This ammo is not attracted to a magnet and is non-corrosive. Fiocchi ammunition has a proud Italian heritage for precision engineering and as their products have gained a great reputation in the States they have increasingly turned to loading their ammunition at their Missouri factory. A: This depends on your zip code and whether you are considered to be inside Sac City. Please email customerservice@bulkammo.com for details.